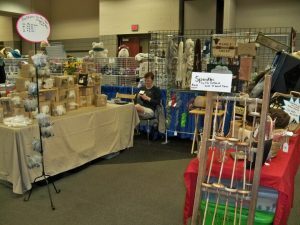 BFL fiber was well represented at the recent MidOhio Fiber Fair, held in Newark, OH. Breeders Anne Bisdorf and Lisa Rodenfels had adjoining booths at the show. Anne had raw fleeces and natural rovings; while Lisa’s booth featured natural white and dyed BFL yarn and dyed locks in a rainbow of colors. Here is Anne’s very attractively displayed booth. 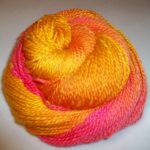 An example of a dyed BFL skein.